PLY Magazine, Summer 2018 Issue... is HERE! PLY Magazine, Summer 2018 Issue Has ARRIVED! PLY Magazine, Flyer-led Issue is HERE! Kudos to PLY Magazine – it’s been 5 years! It is difficult to even think of life as a hand spinner without PLY Magazine. It has become such a valuable resource in a relatively short period of time. Thank you @Jacey Boggs Faulkner and ALL (your entire team) who bring us this awesome publication! 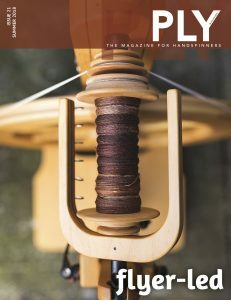 It is difficult for me to describe PLY Magazine to hand spinners and fiber artists. I’m grateful for the opportunities I’ve had to contribute to PLY Magazine. I’ve always enjoyed the Hot Button topics in PLY Magazine. It is great to get another spinners perspective. It is part of this amazing community of spinners sharing, learning, and growing with one another. I’m honored to be chosen as one of the featured spinners to provide my perspective in this issue! Which wheel do you choose to use to do production spinning? …Why? I challenge you. Give it some thought. One of the things I enjoy about each issue of PLY is the self challenge, self questions, and discovery. All a part of becoming a better spinner. You can get a copy of the Summer 2018, Flyer-led issue of PLY Magazine at your local yarn store or online @PlyMagazine. This is a jam packed issue full of all things Flyer-led. Reading Stephanie Gaustad’s article “Wheelspotting” had me checking my drive cord and brake band to make sure they hadn’t wore out. Ever give any thought to the material of your drive band? “Band Practice with a Variety of Materials” by Kathy Sparks. Really gets me thinking. There is so much more in this issue. I hope you’ll check it out. There are some projects I’ve ear marked already. In the office… glancing out the window. Days like today are a challenge to stay focused. The gentle rustle of the willow branches mingle with birdsong, chimes, distant airplanes. But it’s time to get my focus back on the ALL things studio. 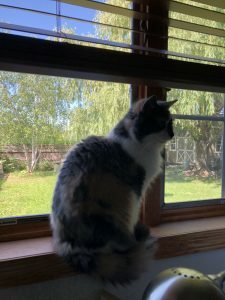 Fleeces to clean, projects to be worked on, and the office awaits… with my grand cat, Scout. She is staying with us while Amber, our daughter is traveling abroad this summer. 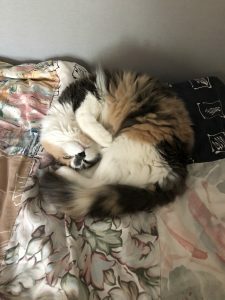 Isn’t she cute… and spinnable? Yes, Scout… I’ve started collecting your fiber. I believe you shed more than any other animal I’ve worked with. You remind me of the angora bunnies! I’m blessed to be a part of the resurgence of twist, as a hand spinner creating yarn. Enjoying the journey… spinning with passion.